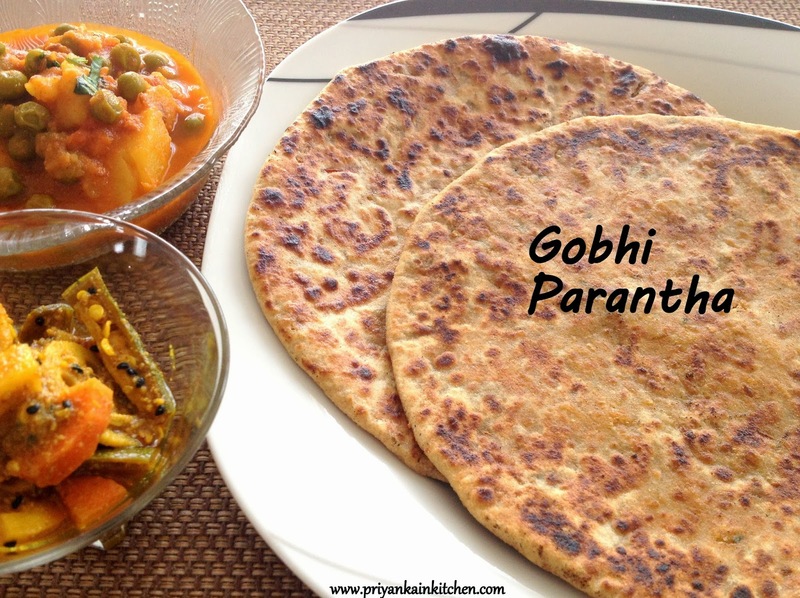 Gobhi or Gobi Parantha is an Indian pan fried bread with cauliflower stuffing in it. A highly flavorful bread that can be served with any curry, pickle, butter or yogurt. I personally prefer to serve it with Potato-Pea curry and pickle. Take flour in bowl, add salt and knead a soft dough using water. Keep aside for 10 minutes. 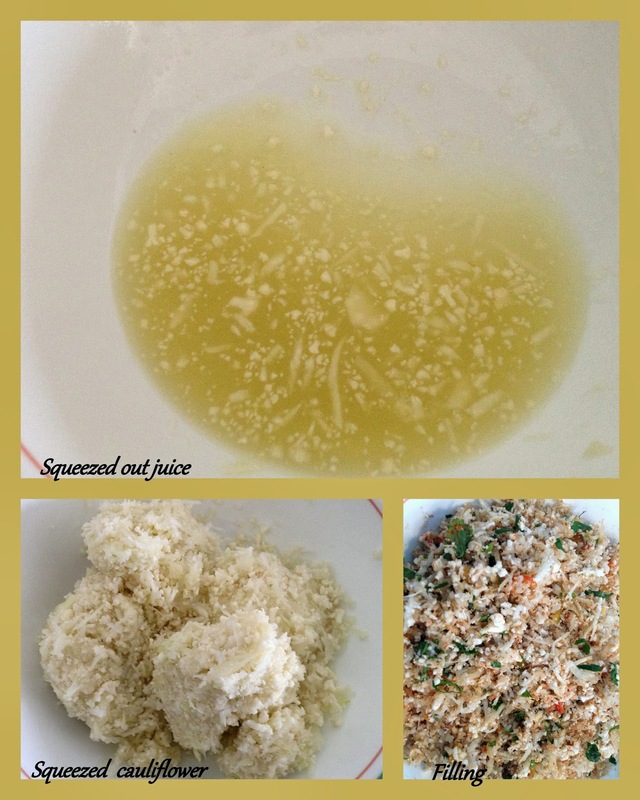 Squeeze the grated cauliflower as hard as you can and keep the squeezed cauliflower in another bowl. It will not yield too much of juice as shown in picture but if not taken out, it will be difficult to have a good stuffing. Mix everything except salt in the cauliflower. Keep aside. Knead the dough well again and make lemon sized balls of the dough. 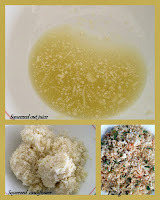 Add salt to the filling and mix well. Remember to add salt just before you start rolling, otherwise cauliflower leaves a lot of moisture, making it difficult to roll nice paranthas. Take a ball and roll it to a 4 inch circle. Place good amount of filling on it. Bring the edges of the circle to the center by continuous joining of the edges. Seal the edges in the center. Press with palm to flatten it. Dust and roll first with sealed side up. Dust again and roll with sealed side down until its a circle 2 mm thick. Heat a skillet. 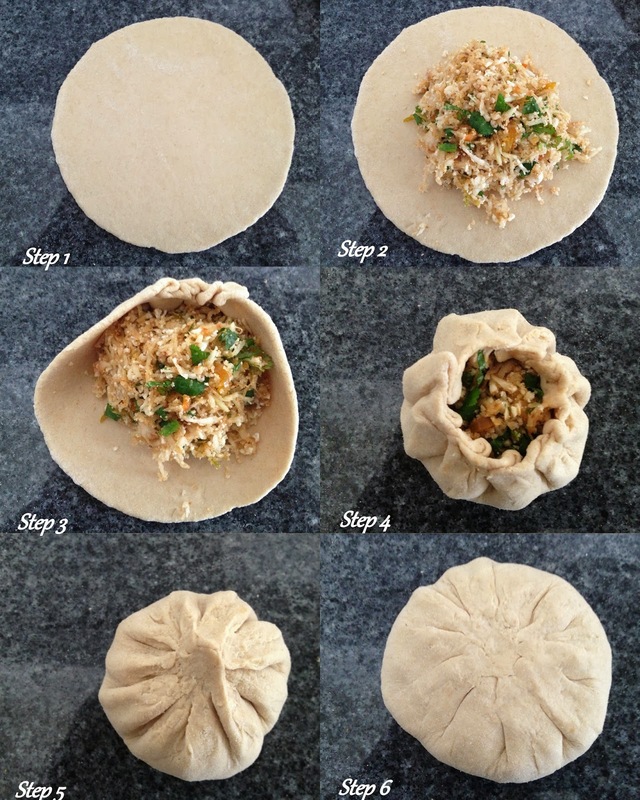 When hot, place the rolled parantha with sealed side up. When bubbles start to appear, or few golden spots appear on the bottom side, flip it. Apply little oil on top. Spread with spatula. Flip again. Apply more oil if needed. Gently press with spatula and cook until both sides are golden brown, flipping as and when needed.